We had wanted to take the fast ferry across the Dead Sea from Aqaba to Nuweiba we had seen advertised and talked about on the internet. This service, unfortunately, had been terminated. Our only option was to take the overnight ferry, leaving just after midnight, in a few hours. There was no choice. We purchased the tickets at a ticket office from a nice Jordanian man who had lived in South Carolina for some time. He inexplicably gave us a discount (55 dollars off!!) on tickets that had a set price by the government (two governments) and then called his friend who was a taxi driver to pick us up from our hotel at 11 pm and take us to the ferry. His friend wasn’t as nice and tried to get as much money as possible out of us for the ride. We ended up paying way more for the taxi than we needed to, but in the end we still came out ahead thanks to the discount. Sometimes it helps not having a computer tracking every human action. It certainly helped us get a discount, though it would create some nervous moments later. We were told multiple times at the ticket office that we could purchase a cabin in the boat when we arrived for 10 USD. This would make our journey way more comfortable and allow us to get some sleep. We arrived at the boat and asked about the rooms. We were laughed at. “Not this boat,” they cackled. We would have to sleep on the benches or the floors. That was the least of our concerns, however, because we were receiving conflicting advice from every person we talked to about receiving an exit stamp in our passport, so we could board the ferry to Egypt. We finally found the building where we were supposed to get this stamp and discovered madness inside. The lines at the windows where the customs officials were were outrageously long and people were often sliding ahead in front of us. Eventually, some Egyptian man told Eric to go to the front of the line. So, he walked right up to the window and I joined him. We got our stamps and no one seemed to mind we had jumped to the front of the line. We got to the ferry and they let us on to search for an uncomfortable place to sleep for the overnight trip. The term overnight boat also turned out to be a misnomer. The boat seemed to crawl as slowly as possible and still arrived well before daybreak. The overnight part mostly referred to the time it took to complete the circuit through the bureaucratic nightmare that was customs at Nuweiba Port. The ferry pulled into port at a little before 3:30 am. We got off the boat at 5 am. We passed out of the port gates at 6 am. The sun was far from up when we pulled into port but it was in the sky by the time we cleared customs. While we were transiting across the Dead Sea there were many announcements. All of them were in Arabic. We we tried to disembark the boat the customs officials berated us for not getting an Egyptian stamp in our passport. We asked where we were supposed to get the stamp. They repeated louder, “Where is your stamp!” Our passports were collected, and they walked off with them. We were told we could collect them at the customs office. We weren’t told where it was. All the signs in the port were in Arabic. We were without our passports and had no idea where to go. We started to wish there were computers tracking our passports and telling us where to go. Being strangers in a strange land isn’t all it’s cracked up to be. Luckily we were born in an English-speaking country and have almost never had to experience this. We eventually found the building by following around another person who had had his passport collected. He didn’t speak English, but he did speak Arabic. It seemed as if he had to ask everyone in the port where to go, but he eventually found the customs office and so did we. It probably took another 45 minutes to take care of everything we needed to, but at least during those 45 minutes, we could see our passports. It made us feel better. When we got our stamped passports back in our hands we joined the baggage inspection line. Here, our white skin color also allowed us to bypass a line others had to wait in. We were waved to the front, dropped our bags on the x-ray machine conveyor belt, and picked them up on the other side, taking one minute to complete a task that rightfully should have taken us thirty. Again, no one seemed to mind. We cleared customs with our passports in hand. It was a hectic process, but we made it, and even managed to sneak in about an hour and a half of sleep. Flying into Egypt would have certainly been an easier experience, but we don’t have the kind of money or time to afford easy. We take what we can get. At the end of the day, still holding our passports and having arrived in Egypt successfully, we have to chalk that up as a win. 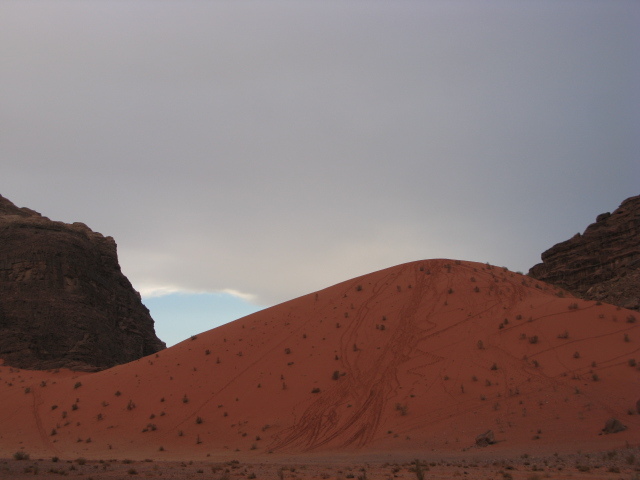 After Petra, we headed south to Wadi Rum, a protected desert area where Bedouins have lived for centuries. The scenery was made famous by the film Lawrence of Arabia. Our guide drove us in his truck through the desert to various sites when we first arrived. 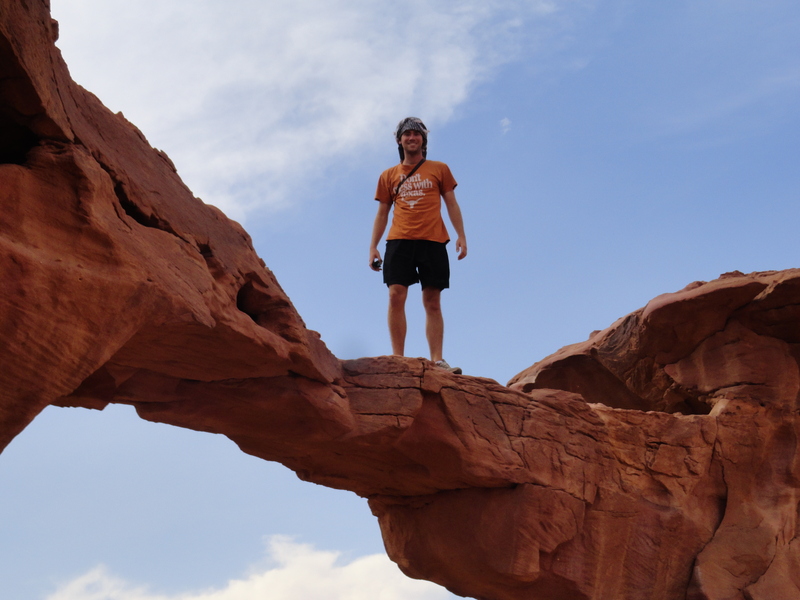 There was a water spring that wasn’t “springing” at the time, a few rock formations, and natural bridges. When we got to camp, there wasn’t much to do. We had tea and chatted. We sat in silence. There was a large, red sand dune in the distance, so we set off to climb to the top of it. This picture hardly does the size of it justice. As we got closer, we realized it wasn’t large. It was huge. Massive. Gargantuan. It took forever to climb. Each step up the dune seemed to bring you right back where you started. The sand kept sliding underneath our feet. The view at the top was nice, though, and it was all worth it when we got to run down it. It got dark soon after. We ate a Bedouin dinner and sat by a camp fire the rest of the night smoking shisha. Our guide’s son played a strange sort of instrument that seemed to be a combination of a sitar and a guitar. We chatted late into the night and then fell asleep under the stars. In the morning, we woke up to find ourselves alone. The jeep at the camp had a flat tire, so our guide’s son had wandered off to the nearest camp to get help without telling us. He eventually came back, though, and provided us with breakfast. Then, we headed off into the desert on foot. We hiked to the nearest village and then hopped on some camels. 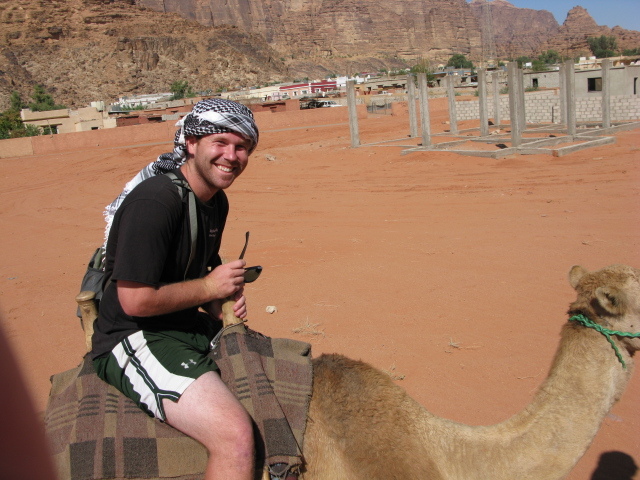 Riding camels is quite an experience. We took them a bit beyond the village to see some more of the scenery, but all we could focus on were the camels themselves. We also had to concentrate on staying on them. Camels are not as graceful as horses. Around midday, we returned to the village. 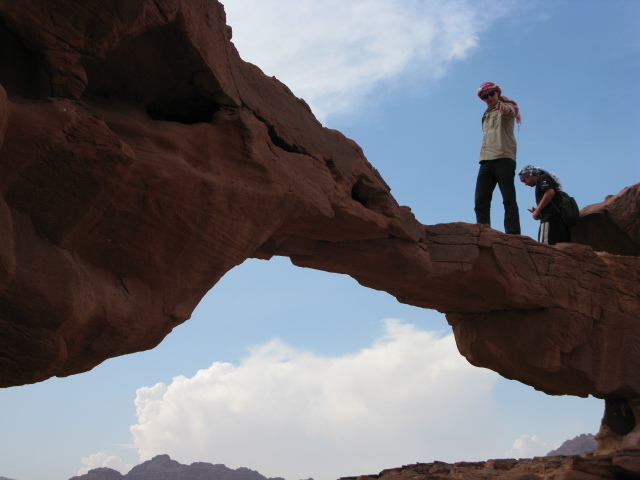 Our time in Wadi Rum had ended a short twenty-four hours after it began. 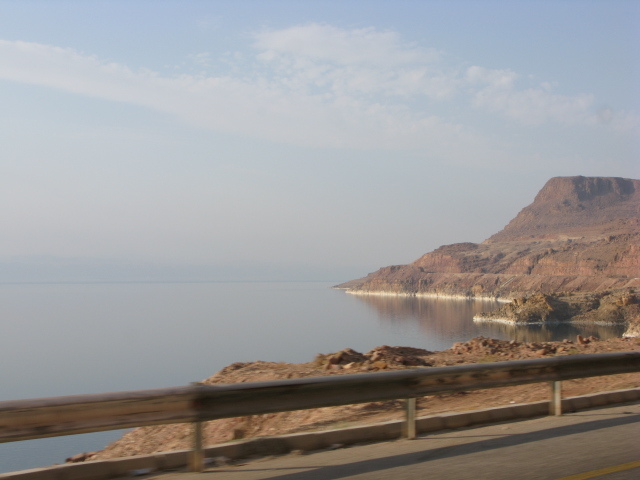 We drove to Aqaba. Dan stayed the night there and turned the car around to head north back toward Amman. We bought him a parting beer then hopped on a ferry departing at midnight for Egypt. In a short few hours, we would be in a new continent. Most everyone has an image of Petra in their mind. It’s just as stunning in person as you would imagine it to be. But let’s start with the previous night and how we got there. Eric: We had picked up beers from a liquor store and walked up to the roof expecting to find no one. Our hostel had been empty the day before, but had apparently filled up while we were out exploring Amman and the Dead Sea. Dane: There were some Australians, an Egyptian, a weird Scottish guy, and another American. His name was Dan and he had rented a car. Eric: Just like high school, we ignored the other losers on the roof and gravitated toward the cool kid with the car. Dane: His itinerary matched up perfectly with ours. Luckily all we had to do was buy him a beer to get in his good graces. So, yeah, it was kind of like high school. Eric: The next day started our road trip through the desert. 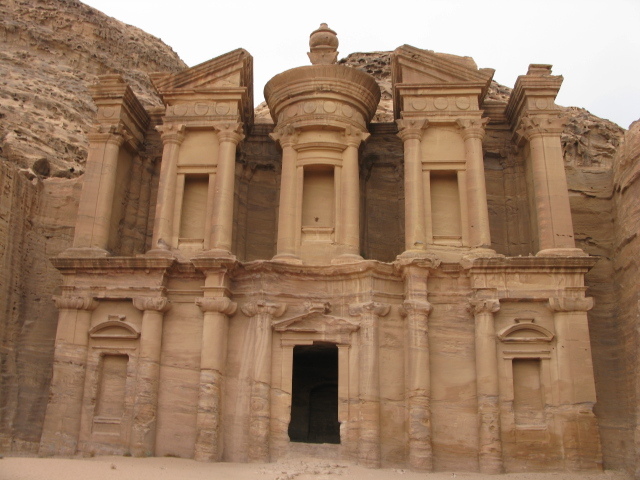 First stop, Petra. 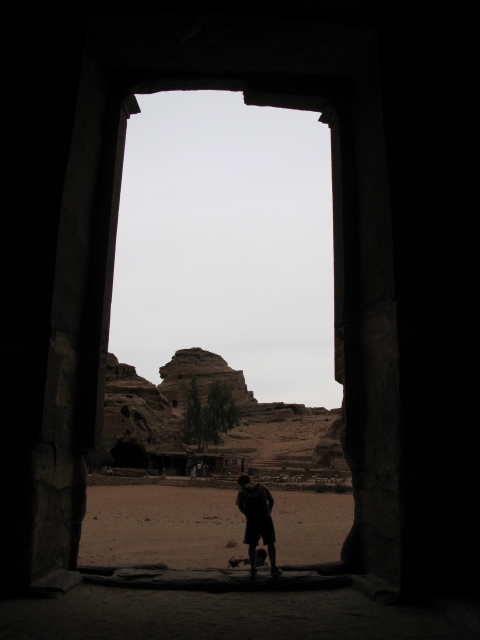 Dane: We stopped for snacks and drinks at a gas station just outside of Petra then hopped back in the car. Eric: And like a high school kid, Dan wanted to show off to his new friends, so he pressed the accelerator to the floor as we went to pull back on the highway. Dane: That’s when the hub caps went flying. We hit a giant pot hole. Eric: Dan scurried out to gather the hub caps off the highway amidst the eighteen wheelers that were speeding by. Then, we continued on our way. Dane: It was clear the tires weren’t right, and we were in the middle of the desert, not exactly the kind of place you want to get stranded. Eric: The rest of the ride was a nervous one, though we eventually made it. Dane: It was clear when we exited the car, however, that the back left tire was completely flat. I’m not sure how long it had been that way, but Dan chose to keep driving on it. Eric: He did buy the insurance. Dane: That was a smart move. Peeling out into the highway and crashing into a pothole, not so much. Eric: Lesson here: road trips always spawn a good story. Dane: It was vast. Never ending. 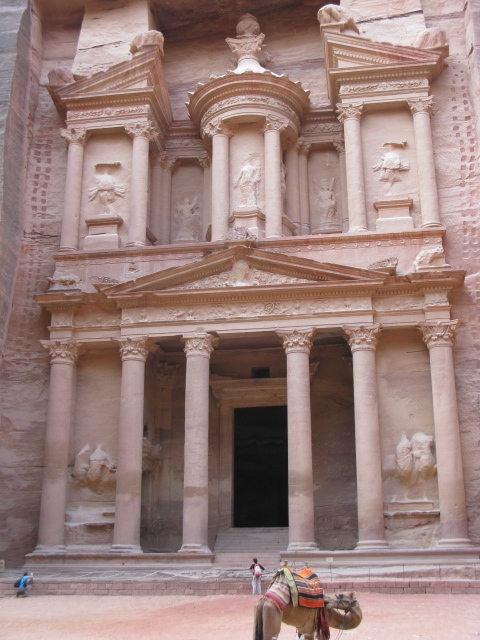 Eric: The moment the treasury building — the image of Petra everyone has — emerged through the canyon was breathtaking. Dane: Nothing really prepares you to see something so intricate and massive carved into the side of a cliff. Eric: And that wasn’t even the biggest facade in Petra. The monastery was even more massive. My favorite part, though, was hiking in and around the caves. Dane: The entire city stretched on forever it seemed. There were houses carved up and down the mountains through the valleys and beyond. Eric: We spent the entire day walking around the grounds. Before we realized it, we had been there for ten hours. Dane: Where does it rate compared to all the sites you’ve seen around the world. Eric: I don’t know. But it’s one of the most impressive things I’ve ever seen. The size of it, the age of it, was very impressive. Dane: I think I’d put it behind Angkor Wat … but nothing else. Eric: I liked it more than Angkor Wat. Dane: We can agree, though, that it was absolutely stunning. Eric: Besides Everest, it’s the coolest thing I’ve seen on this trip. Doorway of the monastery taken from the inside. 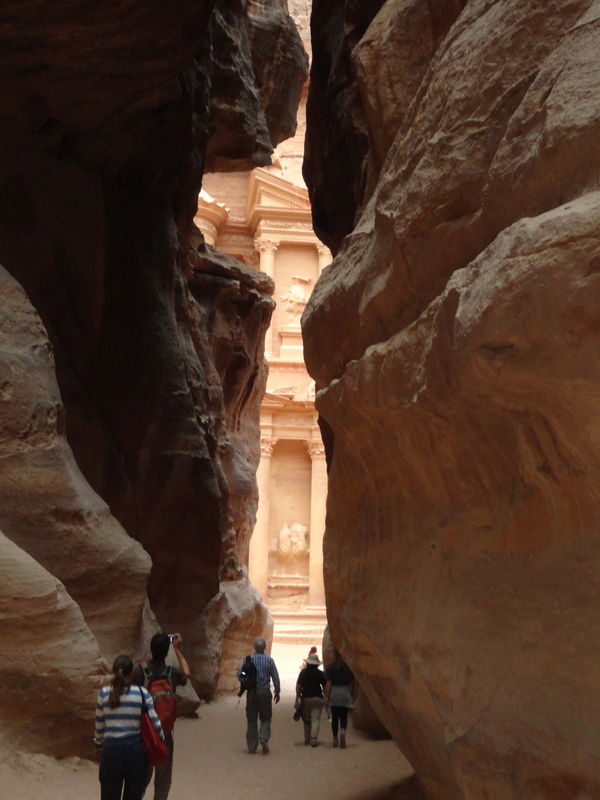 We were a bit surprised by our initial impression of Jordan. It was very modern. The currency was incredible valuable in relation to the dollar. Things were expensive. With the exception of all the women donning hijabs, downtown Amman resembled many other modern cities throughout the world. It was amazing walking and driving around Amman and seeing the ruins of a civilization that stretched thousands and thousands of years. We had seen things like that before, but the sights were given added weight because of their ties to biblical history. Our first full day, we hired a taxi for the day to drive us from Amman to the Dead Sea and to a waterfall in Wadi Mujib (we think). The Dead Sea was amazing. We both knew we were supposed to float in the water, but nothing can prepare you for the actual experience. The water pushes you up on your stomach or on your back. It was a struggle just to maintain an upright position. We were given an hour and a half to experience the Dead Sea and that time flew by in an instant. We could have stayed for hours more, especially as our fingers didn’t prune. The Dead Sea was well worth the trip. The white at the edge of the water is salt. Wadi Mujib was really cool too. We had to hike from the point where the stream flowed into the Dead Sea (which was roughly 400m below sea level) to the big waterfall. The only pathway was to walk through the water. There were ropes set up along the way to help pull yourself up smaller waterfalls along the way. It was a blast! Unfortunately, we couldn’t take our cameras with us because they weren’t waterproof. There was no way to guarantee their safety during the trek so we left them behind. It was a solid day. 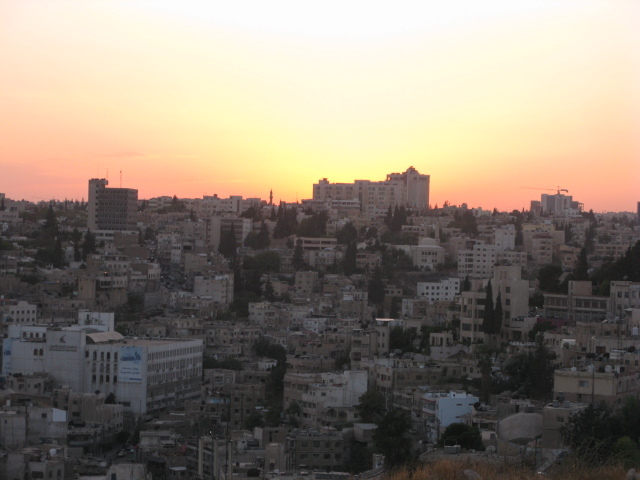 We returned to Amman in time to catch sunset at The Citadel. Afterword we grabbed dinner on Rainbow Street, the most modern, happening place in the city. It was a bizarre collection of Western-imitation restaurants (e.g., Buffalo Wings and Rings and Harley’s Burgers), shisha bars, and clubs. Beers were too expensive in this area for our budget, however, so we headed back to our hostel to see if there was anyone hanging out on the roof. 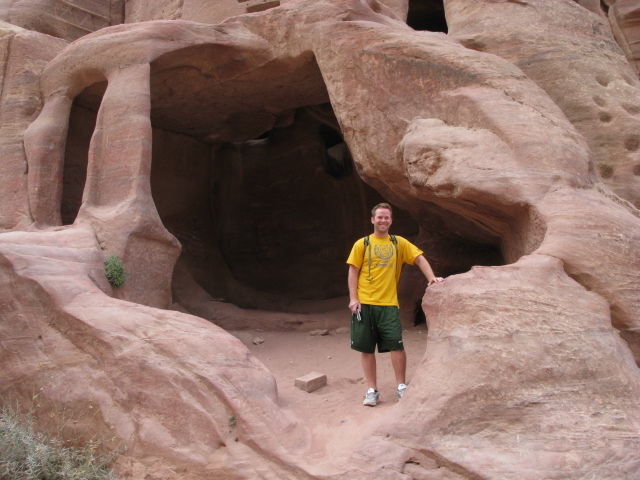 It turned out to be a good decision that would pay off for the remainder of our time in Jordan, beginning the following evening when we departed for our road trip through the desert. We’ll get to the rest of the story in the next post.